Women’s Track and Field is the Rodney Dangerfield of Track and Field. They get no respect. There isn’t a new Miss Usain Bolt that has the potential of setting a new WR every time she steps on the track. The last person I can remember was Marita Koch and the 400 meters. For men events, there’s always a possibility of a WR. For women’s, there’s not a hope in hell. Not even Carmelita Jeter. Take for example Lolo Jones in the 100m hurdles. Her 12.43 PB is way off the WR of 12.21. 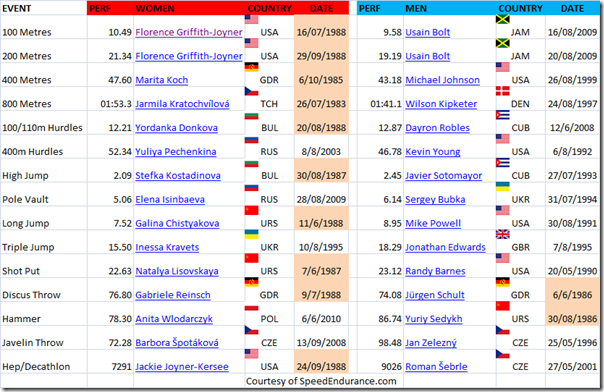 When you look at the speed, power and strength events (and I’m including the multi events, as well as the 800m) the only WR that were broken since the 1980’s was the 400mH. (I kid you not.. the 400mH is a very technical event)The PV, HT, and TJ are relatively new events which explains the excitement whenever Yelena Isinbaeva shows up and has a chance of breaking a WR. The Javelin was shortened so that doesn’t count. I’m talking about the eighties…you know, Duran Duran, Boy George, and all the African Feed-the-World Relief songs. Conversely, for Men’s events, it is only the Discus and Hammer that are still untouched from the 1980’s. As well, the men’s events have created rivalries from different countries, like Ben and Carl. Or Usain, Asafa and Tyson. Donovan and MJ. For one, fan interest. Men’s events will always be the A-card. For the female athletes, it’s less appearance fees and sponsorship dollars. So unless they wipe out the old records, change the distances (like bring back the 500 meters), or a teenage mutant female Usain Bolt comes along, women’s track and field will always suffer compared to the men. Coincidence or not but most of the above female records were last set in 1988. Isn’t that the year that Ben Johnson won the 100m gold medal in the ’88 Olympics and prompted the now famous headline: “Why, Ben?” in the Toronto Sun on September 26, 1988? They easily could have asked the same question from the hundreds that competed at that level but I guess someone has to be the scapegoat and major corporations and organizations have to pretend that their particular actions, values and industries are virtuous and above board. But for the athlete, the microscope is never too far away and the lens neatly polished as the individual participants are almost always painted as the root cause for indiscretions. 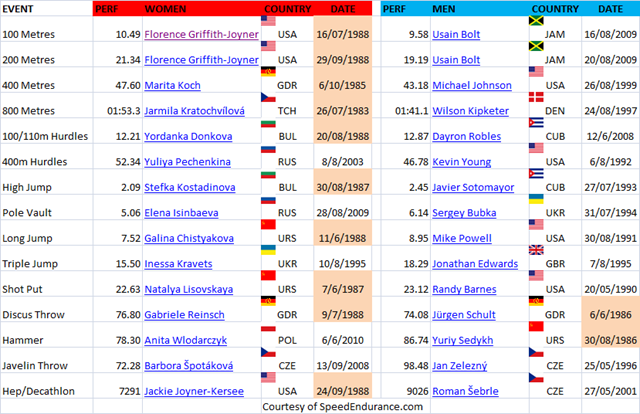 @Fred – yes, the IAAF should review this “coincidence” if they want better marketing for 2011. Sadly, the Caster affair probably took more time and money than they hoped. And sadly, it appears the women’s 800m may be the next record to fall. And then what? Ironically, 2 days after I posed this, the men’s 800m WR was broken. Sally Pearson’s 100 meter hurdles in 12.28 is the closest any women have come to break the WR.